Three weeks after proclaiming that Alabama Senate nominee Roy Moore should leave the race, U.S. Senate Republican leader Mitch McConnell has seemingly backtracked. 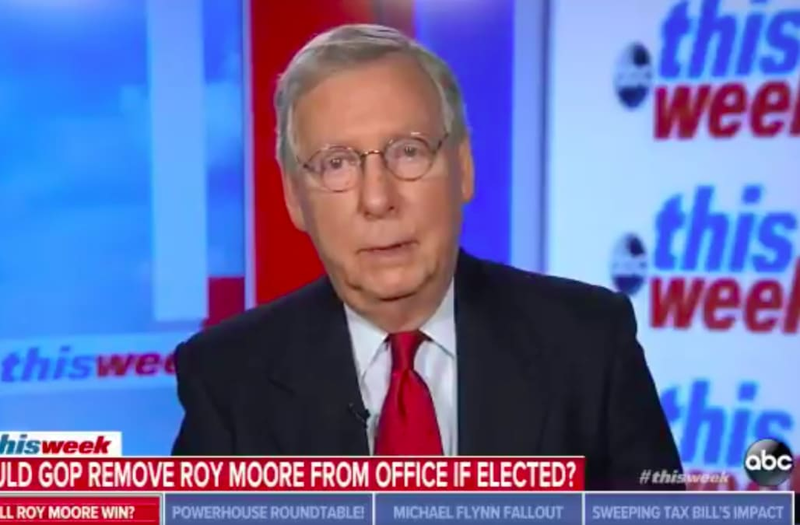 "I’m going to let the people of Alabama make the call," McConnell said Sunday on ABC's "This Week." Pressed by George Stephanopolous on whether he would "take action" should Moore be elected, McConnell said the ethics committee would "consider" the allegations in that circumstance. The statements indicate essentially a 180 in McConnell's assessment of the situation. In November, he told reporters "I think [Moore] should step aside," also noting, "I believe the women, yes." At least five women have publicly stated that Moore romantically or sexually pursued them when they were teenagers and he was in his thirties. Accuser Beverly Nelson, a Republican who voted for Donald Trump in the 2016 election, detailed her account in November: "Mr. Moore reached over and began groping me, him putting his hands on my breasts. I tried to open my car door to leave, but he reached over and he locked it so I could not get out," she said. "I tried fighting him off while yelling at him to stop. But instead of stopping he began squeezing my neck, attempting to force my head onto his crotch." Moore has blamed the "malicious" claims on liberals and the LGBT community, calling them "socialists who want to change our way of life." The comments drew particular ire as they resurfaced previous statements in which Moore said homosexuality should be illegal.